SIGN INTO THE LOG BOOK !! Turn on mercury lamp (at right, on shelf). THIS MUST GO ON FIRST. Check if the computer is on by wiggling the mouse or pressing the shift key. If it's off, turn it on with the round button on the front. This will supply power to the camera, shutters and transmitted light source. Rotate beam splitter to eye only position. To look in bright field or phase press F2 to open/close the transmitted light shutter. To look in fluorescence press F1 to open/close the fluorescent light shutter. For the simplest operation, both software filter settings should be set to #1 and the fluorescent filter turret for single probe imaging should be set manually in the microscope. The condenser labeled "long working distance" (0.55 NA condenser) should be on the microscope. Note: Short and very long working distance condensers are available for this microscope. Please see the AIF staff if you need one of these other condensers. Turn the condenser turret to the appropriate setting (BF, Ph1, Ph2, Ph3, DIC). Halogen lamp diffusion filter is in place (others out of light path). Be sure that the fluorescence (electric) shutter is closed. Press F1 to close it. Turn the filter wheet turret to the "Blue" filter. 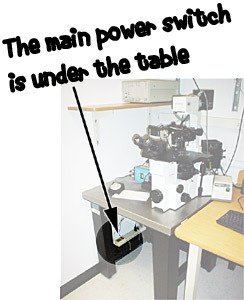 Insert the photo frame by pulling out the slider on the left of the microscope above the focus knob. Adjust brightness with knob on halogen lamp power source. Focus the right eye first by adjusting the knurled ring. Focus the left eye second. You must hold the base of the eye piece with one hand and turn the top with your other hand to adjust. The right occular adjusts easily, while the left is stiff. Please see an AIF staff member if youre having trouble getting the left occular focused. Place your sample on the stage and focus (see instructions below). While looking through eyepieces, you may use the coarse focus when on microscope. DO NOT USE FINE FOCUS KNOB ON SCOPE. YOU MUST FINE FOCUS WITH THE FOCUS MOTOR! There are three settings on the fine focus motor. Adjust with tiny lever on front of the controller box. Open the condenser diaphragm all the way. Be sure that the sample is in focus! Open the luminous field diaphragm until it is at the edge of your field of view. *Contrast (for brightfield and DIC) can be adjusted using condenser diaphragm. (lever on the left of the Long Working Distance condenser). **The Koehler Illumination should be checked and adjusted every time you switch objective lenses or if you are imaging live cells, every time you change dishes . Click here for an illustrated version of Koehler Illumination. There is also a 1.5X "booster" slider on the right side of microscope that increases the magnification by 1.5x. For the simpliest operation, which is one fluorescent probe at a time, both Ludl filter wheels must be set to filter position #1. You then set the filter manually on the microscope. Press F1 to open/close fluorescence shutter. Press F2 to open/close transmitted shutter. 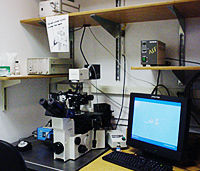 Be sure that the Analyzer and the Wollasten prism on the left and right side of the microscope, respectively are out of the light path. Turn the filter turret to the appropriate fluorescence filter. Position your area of interest in the center of the field. Two methods for taking pictures are mentioned. Observe image as directed above. Turn the beam splitter to . This sends 80% light to the camera. Press F3 for a live preview of your specimen on the monitor. For transmitted light images (brightfield, phase, Nomarski), insert the IF550 filter into the light path and check that the turret is set to 'Blue'. Adjust the exposure time so that the maximum number in the bottom left of the screen is 3000 - 4000. Make sure the microscope is set to . Use Shift + F11 to set the exposure time and binning (image size) for keys F9, F10, F11, and F12. Press the appropriate key to take the picture. Save images as .TIFF format. To collect a transmitted light image (brightfield, phase, Nomarski), press Shift + F2. 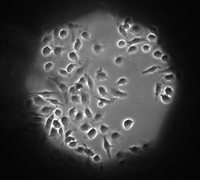 Press Shift + F1 to acquire a fluorescence image. Note: To collect a 1X1 bin image, multiply calibrated exposure time (ms) by 4. Press Enter or click OK to collect the image. The final image should have a maximum number in box at bottom left of window between 30,000 - 60,000. If it is smaller than this, image manipulation will be hampered. Use the 6D acquire or Multimode Acquire commands within IPLab. Z step size; +0.5 step goes a half micrometer up per step and -1 goes a full micrometer down per step down. We may put a microinjection system on this microscope if required. When you're done, remove needle from the microinjection holder. You must disgard all needles, tips, pipettes in the red barrel located underneath the counter. Please dispose of biological material appropriately. Report any spills to AIF staff. ONLY STAFF CAN CLEAN LENS ON THE MICROSCOPE. Copy your files from the hard drive by writing a CD or Zip disk, transferring to RestStop, or use a USB jump drive. If you have any questions about our policy on data left on our computer, please read our policy web page. If noone is waiting to use the microscope immediately after you, turn off the powerstrip that turns off the camera and shutters. If it is a weekday or if somebody is scheduled to be in within 2 hours after you, leave the Mercury Lamp on, otherwise turn the lamp off. If you used it, leave the Short Working Distance condenser in the cabinet and the Long Working Distance condenser on the microscope. Clean up area AND take your belongings with you. Slides or dishes left on the microscope will be discarded without notice.